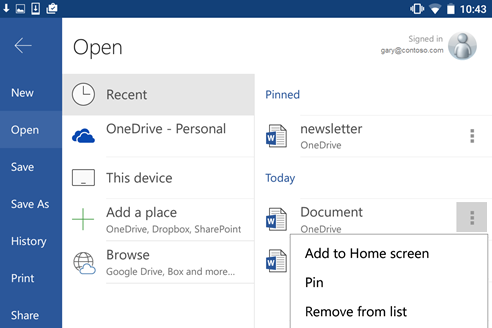 If you have files that you use often, you can pin them in the Recent page and get to them quickly. Tap File > Open > Recent. In the list of files on the right, tap the More icon next to the file you'd like to pin. Now the file will be in the Pinned section at the top of the screen and will be easy to get to. Note: If you don't need to have a file pinned to the top anymore, tap the More icon and select Remove from list. The file will still be available, but it won't be in the list of pinned files anymore. Select Add to Home screen. You'll see the file on the home screen of your phone or tablet.